Several months ago while looking through one of my favorite magazines I saw an article about a man who had started a career photographing grains of sand. Not just any photographs, mind you, but photos taken through high definition microscopes which reveal the unique character of each individual grain of sand. Like snowflakes, no two are alike. Dr. Gary Greenberg* has filled gallery exhibitions from Hawaii to Arizona with these photographs. Most of the photos show close ups of individual grains of sand, which reveal their origins as tiny, tiny bits of shell, coral, volcanic rock, or even the skeletons of tiny sea organisms. They come in all shapes and even colors. Stars, hearts, crystals, spirals, a never ending array of shapes, and none alike. Some are square, some are oblong, and some are even flat. And the colors….blues, yellows, purples, oranges, reds…. who would ever have thought? Every time we walk along the beach, we are walking on innumerable years of history, condensed and worn down into tiny grains. We pick up a handful of sand and look at the grains, but it’s impossible to see with our un-aided eyes the beauty and magnificence of each grain of sand. We see a conglomeration of tiny bits of stones, mostly appearing to be shades of brown and cream and white. We can’t see the actual tremendous individual beauty of each piece unless we are aided by intense magnification. And we can’t even begin to imagine the number of each individual grains of sand just held in our hand. Let alone how many grains of sand there are in that one beach itself. Not counting the other beaches all around the world. The Lord promised Abraham in Genesis 22:17, “I will surely bless you and make your descendants as numerous as the stars in the sky and as sand on the seashore….” In I Kings 4:29, we read, “God gave Solomon wisdom and very great insight, and a breadth of understanding as measureless as the sand on the seashore.” Hosea 1:10 tells us “…the Israelites will be like the sand on the seashore, which cannot be measured or counted.” Why did the Lord use stars and grains of sand as examples to show a measure of infinity? Because they are so numerous they could never be counted by anyone but the Lord himself. We are taught these grains of sand become the miniscule shapes we see under the microscope by being beaten and pummeled by the waves of the sea, and while physically we know this is true, we also know it is another part of the divine plan of nature given to us by God. He designed this for us. Not only did he design the overall element of the sand on the beach, he actually designed and formed each and every grain of sand in its very own unique design and shape and color. No two are exactly alike. And when you think about how many millions and billions and trillions and even zillions of grains of sand there are, and how no two are exactly alike, you cannot help but be awestruck by the power and design of the world created by our God. Just like He created us. None of us, not even identical twins, are exactly alike. Identical twins may look so closely alike that most people cannot tell them apart, but their fingerprints are always different, and you will most likely find some other little subtle differences (the size of their eyes, for instance, or a mole on their skin the other does not have) that most people would never notice. Similarly, we are like grains of sand on the Lord’s own beach. We each have unique traits and characteristics, gifts and experiences, that are ours, and ours alone. Like grains of sand, we are tumbled and tossed by the waves of life, which may change our outward appearance, but we are still always, and forever, uniquely “us”. Because that’s how He made us. 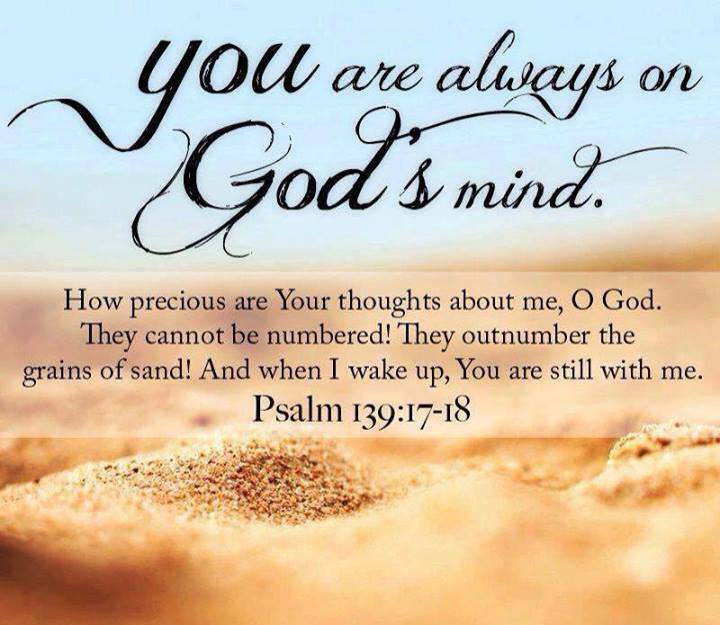 And just as He knows what each and every grain of sand looks like, because He created them, He also knows each of us intimately because He created us. He knows our hopes, our fears, the deepest desires of our heart. Like those grains of sand, we were each created individually, and for a set purpose. 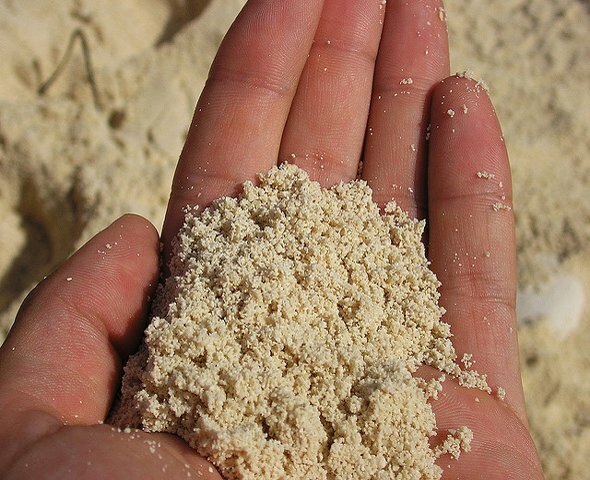 The next time you’re at the beach, pick up a handful of sand and let it sift through your fingers. Take a close look at the grains that still cling to your fingers. You can’t see the unique shape in each one with just your unaided eyes, but try to imagine what they really look like close up. That’s how the Lord sees you. In the palm of His hand, but magnified by His heavenly eyes. You see an insignificant grain of sand, which looks to us like every other grain. But the Lord sees us exactly how we are, exactly how He created us. He knows our true beauty…the beauty we don’t see for ourselves, because we don’t look close enough. But like with that tiny grain of sand, there’s a unique beauty in each of us that’s just waiting to be discovered. Even if we don’t feel beautiful, the Lord knows we are.